At any of our 3 stores located in Xàbia, Moraira or Xaló, We have an expertly qualified team of mechanics and extremely well equipped repair and maintenance garage for bikes. Each and every bike we look after rom the largest part to the tiniest of details, we treat as if it were our own. Taking this step allows us to go the extra mile and ensure that all our clients are content. Our ethos is a happy customer is the best PR possible. We will repair your bike no matter the state it is in, and within the time agreed upon. With more than 25 years looking after customers and their bikes, at Xabia’s Bike we know how to deal with any situation that may be required to fix your bicycle. Our Garages are all equipped with every single tool you may need to fix and maintain a bike. In many cases if we can fix it at the moment we will do so! And don’t forget! If you purchase your bike from any of our stores, each year you will get a completely free bike service and maintenance. If you need to repair or maintain your bike, feel free to visit any of our stores or book an appointment via Email or telephone. As always we will be more than happy to help you with any issues. A prestigious after sales service is what makes a real brand stand out, this is our main ethos that we will always stay loyal to. 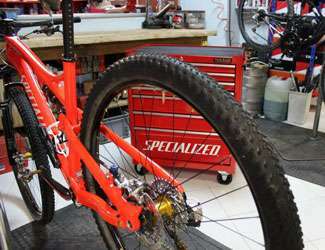 An impeccable repair service is crucial to any bike shop. At all our stores we have a fully equipped garage to repair any issues. Maintaining your bike is key to keeping it running smooth. At Xabia’s Bike we give you a free yearly maintenance for any bikes you purchase from us.